Study testing high-dose influenza vaccine in high-risk ACHD patients. A North American INVESTED study will test the hypothesis that high dose trivalent influenza vaccine will reduce cardiopulmonary events to a greater extent than standard dose quadrivalent influenza vaccine in high-risk cardiovascular patients with a recent history of myocardial infarction or heart failure. An ACHD sub-study will investigate the effects on ACHD population. Already received the influenza vaccine this year, you are not eligible to participate this year. However, you can still contact the closest recruiting centre to be screened for eligibility for next year's flu season. See below how to contact the nearest recruiting center. Below is the full INVESTED TRIAL- FAQ for Patients with Congenital Heart Disease for details, eligibility and ways to enroll. What is the INVESTED trial? Influenza virus infection (the 'flu') contributes to a considerable burden of heart- and lung related hospitalizations and death each year in North America. An adequately dosed flu vaccine may prevent these events by generating sufficient antibodies to the flu. The standard flu vaccine is, however, inadequate in many patients because the dose does not provoke their immune systems to make enough antibodies. Research shows that with a higher dose flu vaccine, more antibodies can be produced, leading to better protection from the flu and potentially downstream cardiac events. 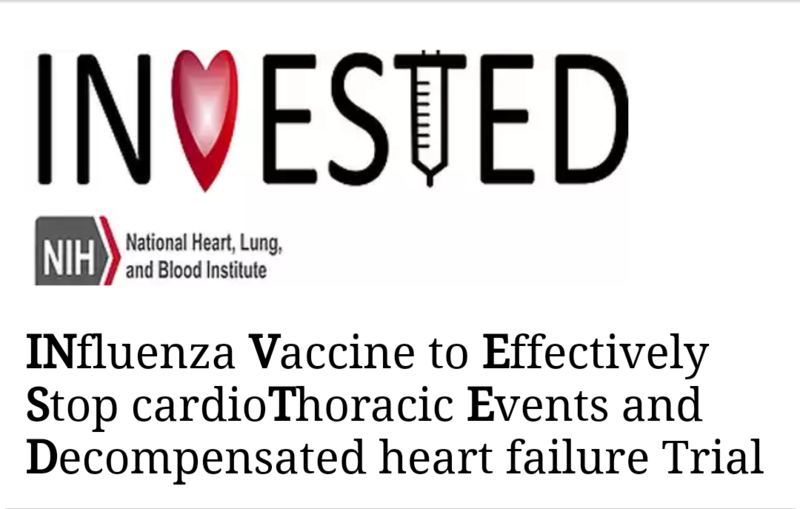 INVESTED trial (www.investedtrial.org) is short for INfluenza Vaccine to Effectively Stop Cardio Thoracic Events and Decompensated heart failure. It is a is a 9300-patient trial sponsored by National Institute of Health randomizing heart attack and heart failure patients to annual vaccination with either high-dose or standard-dose flu vaccine to determine if the high-dose vaccine can better reduce heart and lung hospitalizations, health care use, and premature death over three flu seasons. What is the Adult Congenital Heart Disease (ACHD) INVESTED sub-study? The rationale behind INVESTED is that high-risk patients have blunted immune response to routine vaccination and may need higher doses. ACHD patients are, by definition, high-risk patients with documented evidence of heart failure (lack of appropriate pumping of heart chambers) and more coronary artery problems. The plan is to ensure that 500 of the 9300 patients have ACHD to see whether higher doses of vaccine can prevent lung/heart disease in this patient population. What is the significance of this study for ACHD population? We know that adult with congenital heart disease have poor access to preventive strategies such as vaccination, primary care visits and follow ups in bigger centers. This trial, regardless of its final result, will highlight importance of primary care prevention in this patient population. Moreover, if we can show that a high-dose flu vaccine strategy provides better health benefits, we can improve outcomes in this high-risk patient population and also determine the cost savings of this strategy to the Canadian health care system. The executive leadership of the parent INVESTED study is Dr. Jay Udell from University of Toronto, Dr. Scott Solomon from Harvard Medical School, and Dr. Orly Vardeny from University of Winsconsin. The ACHD sub-group is being conducted by Dr. Payam Dehghani from Prairie Vascular Research Network. Can any adult patient with congenital heart disease be enrolled in this study? No, patients must be eligible for the parent study in order to be registered for the ACHD Sub-study. To be eligible for the parent study are required to have been hospitalized related to your heart condition over the last 2 years. For further details, please refer to www.investedtrial.org and diagram below for a quick reference. What if I already had my flu vaccination this year? If you have already received the influenza vaccine this year, you are not eligible to participate this year. However, you can still contact the closest recruiting centre to be screened for eligibility for next year's flu season. How can you know whether you are eligible for this study? People with heart disease who become infected with influenza are more likely to have heart attacks and those with heart failure are more likely to be hospitalized. Yearly vaccination for influenza has been shown to reduce the risk of major cardiac-related events.